A single yeast cell contains an average of 42 millions proteins. The majority of the various 6000 proteins exist within a narrow range, from 1000 to 10000 molecules, but some are fewer than 10 and others half a million. 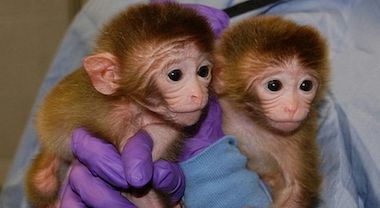 For the first time two healthy monkeys have been cloned…. For the first time two healthy monkeys have been cloned. In eggs the DNA-containing nucleus were removed and replaced by DNA from monkey fetus. These reconstituted eggs were placed into a female and grew to birth. The procedure could be adapted for humans with gene editing to correct genetic disorders. The arc protein has properties similar to those of viruses…. The arc protein has properties similar to those of viruses. Arc proteins are assembling in large structures, called capsids, and carry genetic information from cell to cell. This protein is involved in storing long-term memories and learning. Several types of white blood cells spray out a web of mtDNA strands in a couple of minutes, when the body is under attack from bacteria and viruses. This web sends signals to the surrounding cells and cause other white blood cells to release interferon type 1, proteins that help regulate the activity of the immune system. Human muscles have a memory at DNA level. Epigenetic modifications tell the genes in muscles to be active or not and to grow again following exercise in earlier life. A new method producing high resolution 3D images of all 46 human chromosomes shows that chromatin accounts for only 53 to 70% of the total content of the chromosomes. A structure called chromosome periphery accounts for the remaining 30 to 47% and could act like a sheath, keeping chromosomes isolated during cell division, preventing from errors. New neurons produced in adults react preferentially to reward-related sensory stimuli and accelerate the association between sensory information and reward. The neurons generated shortly after birth are unable to perform this function.